c.1982/84? | age 14/15? I loved the sound of Vader saying “I’ll take him myself” on the audio tape segment that I recorded from the BAFTA awards show—in 1978? I would no doubt have still been thinking of that as I drew this page a few years later. 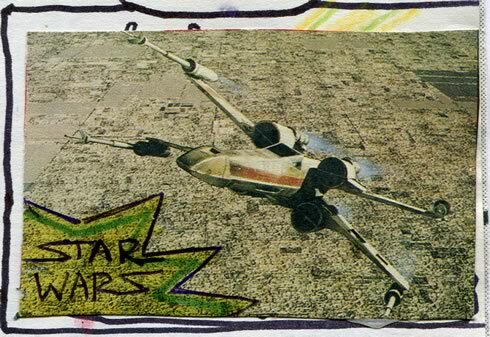 A precious image, clipped from the ‘Star Wars Storybook’—and then defaced, to emulate a <trading card? And I wonder what the drawing underneath was? 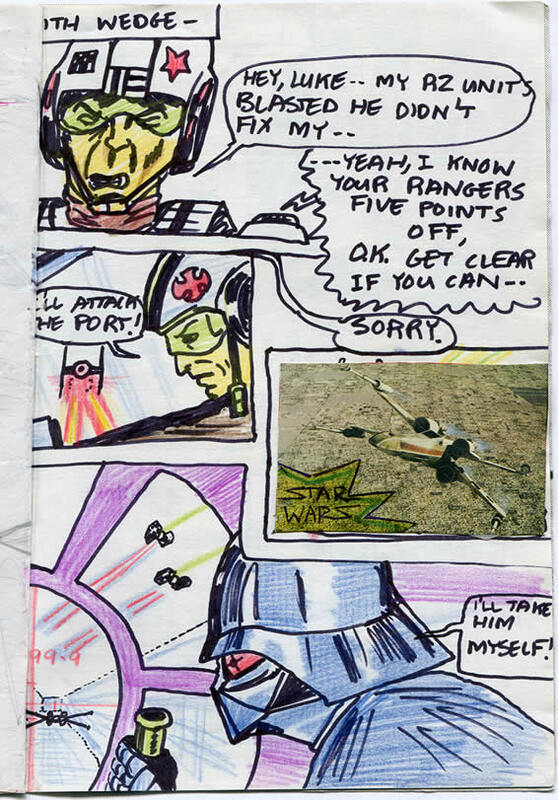 You might have noticed that pasted-in X-Wing photo in today’s page? That was another generous donation by my pal Niall F whilst in primary school. He actually cut them out of his Star Wars Storybook. Eek! You might have seen «some of the other ones that he donated—or was cajoled into donating, in earlier pages! Sarcastic? Oh, yes! Neither of those look my writing though. I suspect that Niall wrote down what I’d whispered in his ear—during class—and then wrote a funny response to it in a speech balloon. Here are another two clipped-out photos, with the knock-kneed Stormtrooper, and the other one that I really loved: the Star Destroyer! I copied the latter photo on «this other page. But how on earth could Niall—a crazy Star Wars fan, just like me—bring himself to cut-up the book like that? I really don’t know, but it was very very nice of him to give them to me. What a pal! And they’re preserved forever, in SWa9 comic. He’s a cutie pie alright. You’re right – he’s really sarky. Oh I see. You think so? Before or AFTER she morphed into a reptile?